Stephin Merritt has had an extraordinarily varied career. 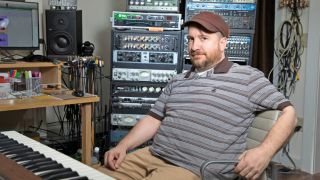 Although he’s collaborated with several other bands (The Gothic Archie/The 6ths and Future Bible Heroes), he’s best known as the principle singer/songwriter of The Magnetic Fields. Beyond that, Merritt has released audiobooks, movie soundtracks, collaborated in musical theatre, and recorded a TV commercial for Volvo. Most of his output has been released on the critically acclaimed Nonesuch Records. Merritt’s 11th studio album is different. The mammoth 50 Song Memoir is an autobiographical concept album chronicling the first 50 years of his life. Even when singing about himself, Merritt’s caustic wit shines through on songs such as Come Back as a Cockroach and A Cat Called Dionysus. Both revealing and unpretentious, Merritt sings on all 50 tracks and plays more than 100 instruments, dovetailing gracefully between acoustic and frazzled electronic pop. Although fairly self-explanatory, what was the motivation behind the new album? You also released 69 Love Songs in 1999. Is this type of release simply a result of your prolific nature? Over what period were the songs written? Apparently, you were reading Grace Jones’s autobiography but had to put it down because it might influence the album - in what way? “I read the first chapter and thought it was pretty seductive - I didn’t want to have to live up to Grace Jones’s narrative strategy. I don’t know if she had a ghost writer, but I made a point of not reading any memoirs or autobiographies for this project; I just didn’t want to compare myself to any of them. The track Foxx and I presumably pays homage to John Foxx? You did a Gary Numan cover some years ago. Have you ever considered asking him and John to collaborate? Is that era where your interest in electronic music comes from? Did having the CS-60 spark you into choosing music as a career path? “I’ve never thought of music as a career path. It’s completely befuddling to me that I’m a professional musician, as I would never hire myself to do anything that I do. ‘By the way, the one thing that you can do with The Yamaha CS-60 is that there’s an audio input, which is just a plug, so what you put into it doesn’t have to be audio at all. I used to have fun connecting the other end of the patch chord to my teeth and making zapping sounds and things. “After the CS-60, I got the Roland TB-303 and the 606 drum machine. There was a DIN cable, which was a precursor to the MIDI cable, connecting the two. The TB-303 was the first sequencer that I had – before that, everything I did was hand-played. I guess the first computer I had was an Apple in 1986 - which had 512KB of memory - and I got the Roland S-50 sampler. 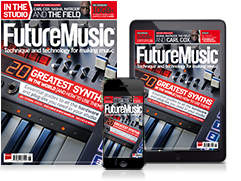 I’d read about the software Performer in Computer Music Journal, which said that it allowed fine-grain quantisation in synths, so you could make MIDI events that didn’t sound like clockwork. What do you think of the path electronic music has taken since then? “There haven’t been many new ways of making an oscillator sound. I think we’ve had 50 years of a few waveforms, but what is new are aleatory, or alien, instruments like the Swarmatron and the Crackle Box - things that aren’t completely controllable. So I think there’s actually an avant-garde scene again, at least instrumentally, and that part I find exciting. When you say chance-based, are we talking about devices that are not designed to make it easy for you to do everything? Funnelled in the same way that the explosion of modular is led by their affordability? The autoharp makes it very easy to make a certain kind of music - once you’ve tuned it, which is actually quite hard to do. It can make exactly one kind of music, or maybe two. The songs are quite rough around the edges. Is that from a tendency to avoid overproduction? “About ten or 12 songs were produced by Thomas Bartlett, who has an all-electronic studio except for his piano. Thomas’s production choices are much more crystalline than mine… smoother textures. So once the songs got into my studio, I made them rougher and produced on top of him. I prefer more interesting textures, and what’s more interesting to me is warmth and fuzziness. I always like things that change every second rather than samples. Could you also apply that principle to the distinction between analogue hardware and digital software? Does the writing process usually begin with acoustic instrumentation? “No, I never write with instruments. I sit around in bars with a notebook. I write down lyrics, but I expect to remember the music, which is why I write catchy songs - if they’re not catchy, I can’t remember them. It’s hard to compute being able to do that, unless you’re a songwriter, of course. You have an AdrenaLinn drum machine. That was that made by Roger Linn who made the famous Linn Drum. “It’s a very small contribution to the Linn Drum line. It has Linn Drum sounds on it, but can do thousands of things. It’s completely counter-intuitive and can make your guitar sound like a sequencer. It’s sort of a guitar-pedal and a rhythm unit. What other drum boxes do you use? You have some particularly unusual gear. What can you tell us about the Congost Xylomatic? I’m a pretty bad glockenspiel player myself, but I can’t speed up or slow down like the Congost Xylomatic. You can hear it best on the introduction to the track Eye Contact. The Suzuki Omnichord and Casio VL-Tone look like interesting ‘toys’, too. “The Suzuki was designed as a sort of electronic autoharp. It has a little section where you can strum it with a guitar pick. It’s probably plastic, and it’s ribbed so it has some resistance to it. It also has a rhythm unit and a sequencer, but, of course, it never really sounds like an autoharp and no listener would be fooled. Can you describe the Andes Melodica, a mini keyboard that you blow into? And how do you bring it all together on the computer? What’s your DAW of choice? “I use Pro Tools with some plugins. I have the Waves Diamond Collection and a few others - the same ones as Thomas Bartlett, so I can hear what he’s hearing. “In the ’80s, I had Performer, so I naturally moved to Digital Performer when that came out; but my engineer made me switch to Pro Tools because he was familiar with it. It was a really dumb thing to do, and I’ve regretted it ever since, because there’s essentially no sequencing ability in Pro Tools. 50 Song Memoir is out now on Nonesuch Records.